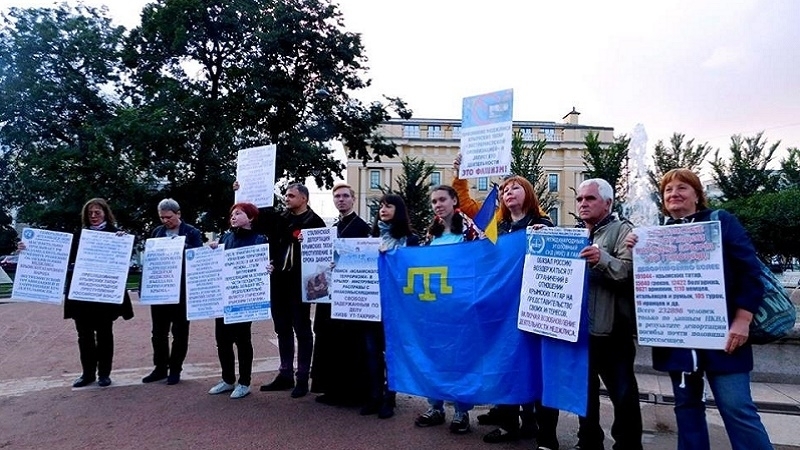 In St. Petersburg, a series of single pickets were held in support of the Crimean Tatars as part of Strategy-18. July 18, 2017 on Nevsky Prospect in St. Petersburg, a series of single pickets in support of the Crimean Tatars were held within the "Strategy-18". This month the action was devoted to the international legal assessment of repressions against the Crimean Tatar people, which began with the annexation of the Crimea. The posters of activists quoted the documents of the UN General Assembly and the ICC in the Hague. Reference: November 18, 2016, an indefinitely extended campaign in support of the Crimean Tatars "Strategy-18" was launched in St. Petersburg in the format of single pickets. The pickets take place on a monthly basis on the 18th day: Activists take to the streets of the city to inform the Russian society about the facts of violation of human rights and freedoms in the annexed Crimea.